Customers buy this product with the Vacutainer Safety-Lok 12" w/ Luer Adapter 23g x 3/4"
label on the side for ID. Do you have any 15 ml red top vacutainer tubes? For 10.0 mL of whole serum, you can expect approx. 50% of the total serum to be plasma. This can vary from patient to patient, depending on a host of factors, but that is beyond the scope of the question. Please note, the VacutainerÂ® Red-Tops, as seen here are for collecting whole serum for those tests/uses that require whole serum with no additive. The lack of any additive however means you will not see a discrete yellow layer of plasma--rather the blood will eventually clot, with residual liquid coming to a rest on the top. While this is largely plasma and some proteinaceous components, it also contains a sufficient number of erythrocytes and free heme-complexes to bear a deep red pigment. Essentially a dark crimson clotted mass on the lower layer, and a largely clear, red colored liquid on the upper layer. 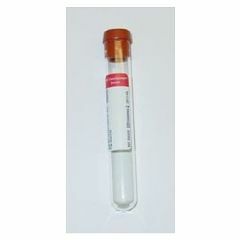 Using a 10.0mL VacutainerÂ® Red-Top (careful, these tubes are specified in terms of 'draw,' that is to say the vacuum is sufficient to properly bring in blood to within approx. 10mL, the total volume of the tube is more...). Hope this is helpful. Answered on Jun 1, 2016 8:13:22 AM by Radiopharmacist from PA, U.S.A. Please add item/products to cart to determine shipping charges. Also, make sure to check out our current promotions. We routinely offer free shipping on orders over $50, 10% off your total order and even 25% off your total order.